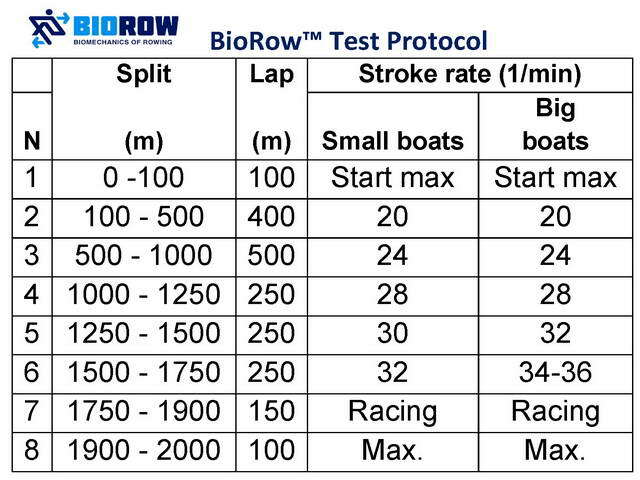 This testing protocol has recieved very positive feedback from both rowers and coaches The test was itself a good training load - the first half is performed at aerobic intensity (UT2/UT1), which allows for a smooth transition to the second half, which features anaerobic intensity. Only the last 500m is performed at stroke rates close to race pace. There can be some variation of this protocol for junior rowers and veterans: e.g. stages N5 and 7 can be replaced with light paddling and a reduction in stroke rate for the next pieces. The data samples are taken and averaged for every stage (see Data Processing).